Not many cafes in Sandgate look out over the ocean. Matthew Thomas does. At least as far as the trees on the other side of Eagle Terrace allow. The cafe itself is in an old house and occupies the ground floor, along with a gift shop and a counter given over to selling fudge. The front of the cafe opens out onto the road and provides a great view of trees and some blue stuff between the branches. The decor was interesting and seemed to feature a lot of clocks and they use Toby Estate beans and make a reasonable coffee. While not especially awesome Matthew Thomas does a good long black coffee. Their big breakfast however is more remarkable. Swapping out eggs was not a problem, and the home made baked beans were really very nice. Their service also really stood out, with attentive and cheerful staff taking care of a reasonable late breakfast crowd. 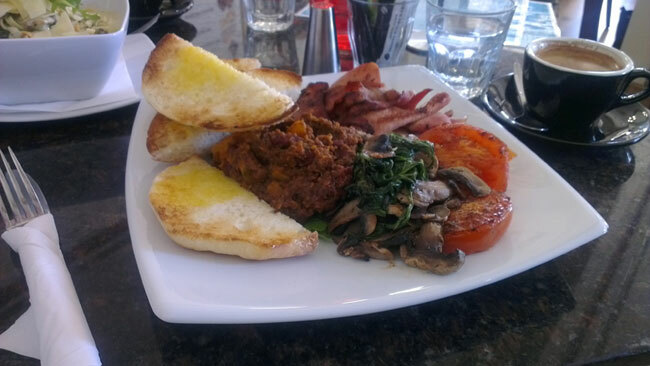 Matthew Thomas is in a good location in Sandgate, with nice decor and a cute gift shop. The coffee is good and the food is better and the fudge is certainly worth trying. Matthew Thomas is certainly worth visiting if you are nearby and in the mood for a light meal. Thanks for a genuine review of your service experience at our Sandgate operation. We appreciate the time you took to adequately describe aspects of what we offer and I am grateful for your kind words. We can never please everybody, though we certainly try to, and I am glad you enjoyed the attitudes of our staff. 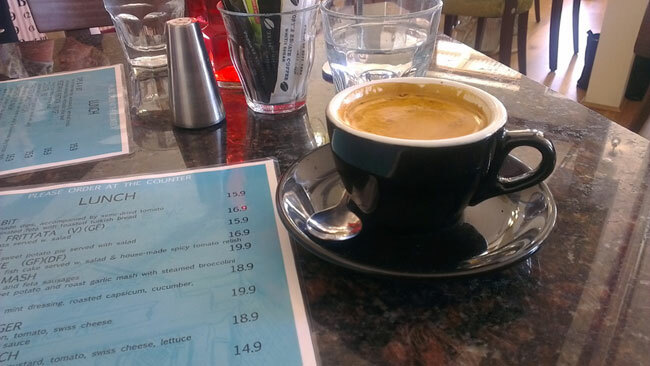 A lot of the reviews we get tend to rave about the coffee rather than the food. I will email this review to the chefs. Hope to see you back when time permits or you so desire. PS My best mate loves long blacks and rates ours, though to be honest Toby’s Estate blends are probably at their optimum with milk…. from the photo attached the one you had was at least well made however with good creme..sometimes hard to obtain with a black. Thank you for you comment, I am actually sorry that my review was so short, and so obviously rushed seeing as you have taken the the time to read it and write a good, lengthy response. Just because I was totally enthusiastic about the coffee, does not mean I thought it was bad. If it was, I would have said as much. I would happily order coffee at Matthew Thomas again. In my opinion, the coffee was good without being remarkable. For me at least, remarkable is going to be a subjective thing, more about personal taste than anything else. However I was impressed by the food. The location and decor were great too, as was the service. Without body and para language it is hard to ascertain how something is said, and I certainly did not take any offence to your review nor am I sensitive to what you wrote. I absolutely agree that coffee brand/roast preference is a subjective thing. I just appreciated your feedback and enjoyed reading some of your other reviews. Come to our Aspley store one day when you have the time, and explore the huge array of products we sell (leaves Sandgate in this area for dead) and have a coffee. Have a peaceful and fun weekend.